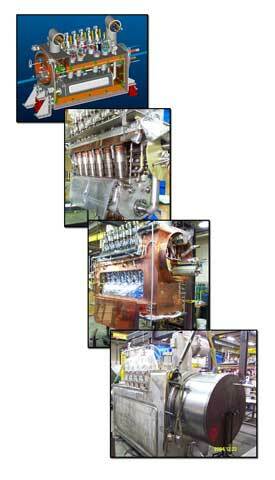 Firing Up the LHC - Meyer Tool & Mfg. CERN, the European Center for Nuclear Research, is headquartered in Geneva and occupies regions of both Switzerland and France, but in addition to its European members countries around the world including the U.S. and Japan have made substantial contributions to CERN's giant new accelerator. The Large Hadron Collider (LHC) will inject its first proton beams in the summer of 2008. An occasion for world-wide celebration, the event will hold special significance for members of Lawrence Berkeley National Laboratory's Accelerator and Fusion Research Division (AFRD), Physics Division, and Engineering Division. 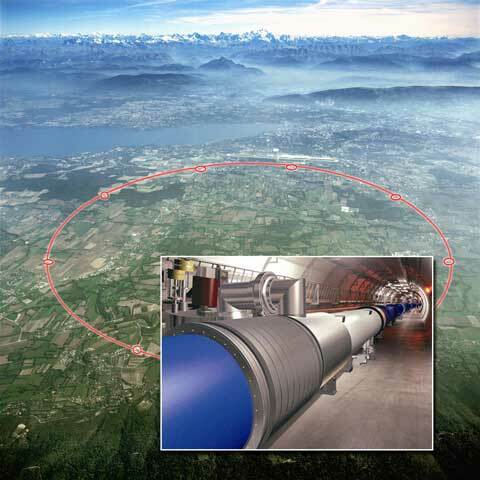 The Large Hadron Collider is placed in a tunnel 27 kilometers beneath France and Switzerland, between the Jura Mountains and the Alps. CERN's headquarters are near Geneva. "When the LHC turns on it will be the world's most complex scientific instrument and will surely be looked back upon as one of mankind's great achievements," says Steve Gourlay, director of AFRD. "I know that the scientists and engineers here at Berkeley Lab and their colleagues at Fermilab and Brookhaven are grateful for the opportunity to contribute to this incredible project. My congratulations to all of them on the successful culmination of many years of hard work." The U.S. LHC collaboration's accelerator project is a $110 million undertaking sponsored by the U.S. Department of Energy. Led by Fermilab in Illinois, with major participation by Berkeley Lab and New York's Brookhaven, much of the effort has concentrated on the final focusing magnets that bracket the LHC's four major experiments. 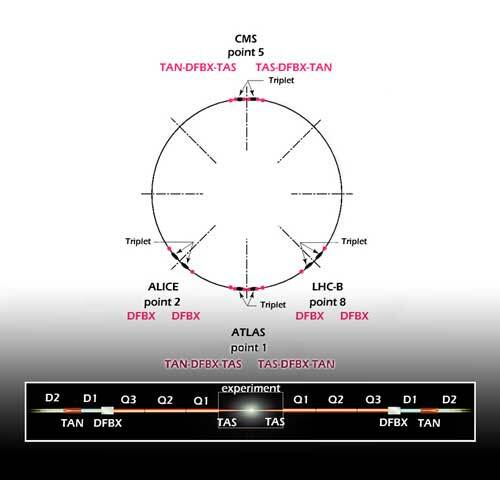 The ATLAS, ALICE, CMS, and LHCb experiments are located at the LHC's four interaction points (IPs) — points around the 27-kilometer ring where two counterrotating proton beams, each with an energy of 7 TeV (seven trillion electron volts), will intersect and collide at a center-of-mass energy of 14 TeV, never before attained in a particle accelerator. ​Fermilab's Jim Strait was the first project manager for the US LHC project. "Essentially we reassembled the collaboration that had worked on the magnets for the SSC" — the Superconducting Super Collider, cancelled by Congress in 1993 — "because among our three labs we'd developed considerable expertise in superconducting magnets," Strait says. Because the LHC's two proton beams travel in opposite directions, each set of magnets is duplicated in reverse on opposite sides of the four experiments, a total of eight sets. Key to focusing the beams are the "inner triplets," a train of three superconducting quadrupole magnets (Q1, Q2, and Q3) which shape the magnetic fields around the separate beams; these move side by side in the same tube as they enter the experiment from opposite ends. Two of the magnets in each triplet were designed by the KEK laboratory in Japan and built commercially (Q1 and Q3), the third was designed and built at Fermilab, and the whole train was assembled in a vacuum-tight housing designed at Fermilab. Triplets of quadrupole focusing magnets (Q1, Q2, and Q3) bracket experiments at each interaction region, with DFBXs between the Q3 magnets and the D1 dipoles. The CMS and ATLAS experiments also incorporate TAS absorbers inside the experiment's shielding and TAN absorbers between the D1 and D2 dipoles. Snugged between each outermost triplet quadrupole, Q3, and a dipole magnet designated D1 — the inner of two dipoles that bring the beams together — is a "distribution feed box," or DFBX, designed at Berkeley Lab, a project led by now-retired engineer Jon Zbasnik with significant input from Fermilab cryogenic engineers Tom Peterson and Philip Pfund. 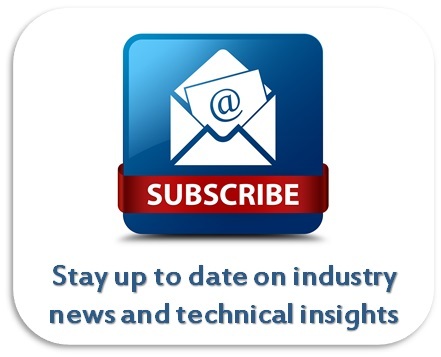 The DFBXs connect CERN's cryogenic systems, vacuum systems, electrical power systems, and control signals to the final focusing magnets. "Each of these systems brings its own technical challenges, which makes the DFBX a very complex piece of hardware," says Joseph Rasson, who oversees Berkeley Lab's engineering projects for the LHC. "The DFBXs also have to fit inside the existing CERN tunnel, originally built for LEP" — CERN's Large Electron-Positron Collider, removed to make room for the LHC — "which adds severe space constraints." Triplets of quadrupole focusing magnets (Q1, Q2, and Q3) bracket experiments at each interaction region, with DFBXs between the Q3 magnets and the D1 dipoles. The CMS and ATLAS experiments also incorporate TAS absorbers inside the experiment’s shielding and TAN absorbers between the D1 and D2 dipoles. 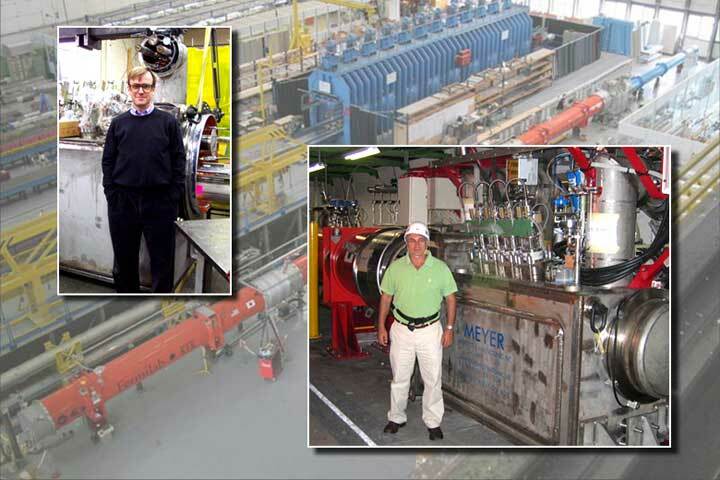 After fabrication in the Meyer Tool & Manufacturing, Inc. plant near Fermilab, the DFBXs were partially disassembled, shipped to CERN, and reassembled in the LHC tunnel. Although the complex DFBX design took longer than scheduled, the lost time was made up in production. Rasson credits Meyer Tool & Manufacturing, Inc. (MTM), near Fermilab, for fabricating and assembling the vessels under the direction of MTM's vice president for operations, Ed Bonnema. At two of the interaction regions, those at the ATLAS and CMS experiments, other important components of the focusing assemblies serve quite a different purpose. When particle beams collide, things fly out, the reason for arranging collisions inside the experiments in the first place. But much of this debris is traveling in the direction of one beam or the other and flies right on down the tube and out the ends of the experiment. To keep this intense radiation from overheating and quenching the focusing magnets — that is, causing them to lose superconductivity and calamitously release their stored energy — two kinds of absorbers soak it up. The Target Absorber Secondaries (TASs) are closest to the experiment and absorb the flux of high-energy charged particles (and some neutral ones) as they leave the interaction point. A TAS also shields the detectors themselves from any unfocused beam particles headed the other way, into the experiment. Each TAS weighs over three metric tons. Jim Strait remarks that Bill Turner, the now-retired AFRD physicist who led Berkeley Lab's overall participation in the US LHC project, regarded the TAS as a particular challenge to the effort. "Turner remarked that the TASs had to be aligned to within a fraction of a millimeter — yet because they are housed inside hundreds of tons of shielding at the ends of the experiments, you can't even see them!" Turner's real interest was accelerator physics, says Joseph Rasson. "He took on the engineering of the final-focus components because he saw an opportunity to participate in the biggest accelerator of the age." "With all this beam power concentrated on a small spot, there is not only a need for massive shielding and great precision, but also an opportunity for a very precise measurement of beam intensity," says Strait. "So inserting instrumentation here was a natural, but Turner and his colleagues had the foresight to allow for extra instrumentation that might come later. 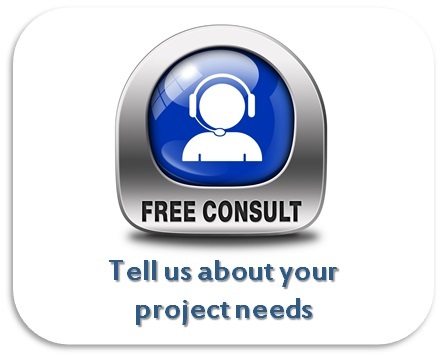 Today a lot of experimenters are finding ways to make use of this opportunity." 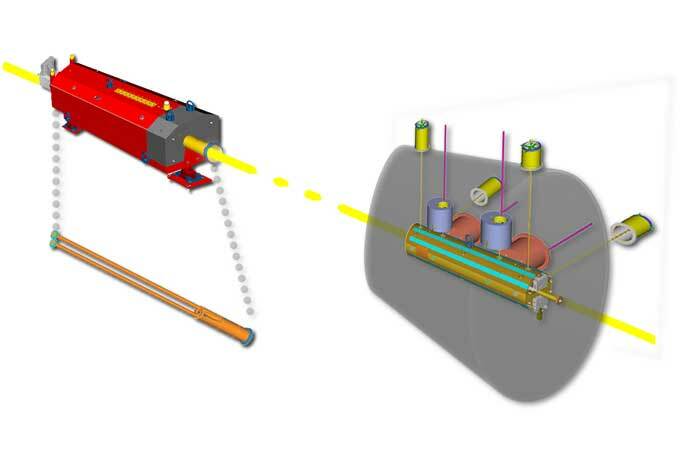 The TAN's instruments for monitoring accelerator operations include measuring beam luminosity, the separation and position of the two beams in the pipe, and other parameters. Berkeley Lab designed and built these instruments and other elements, including beam pipes and lead conductor conduits, in its own engineering facilities or through commercial contracts. TAS and TAN fabrication was begun by Egon Hoyer, now retired, and taken over by Bill Elliott, now at Livermore; both are mechanical engineers. Well before the TAS, TAN, and DFBX pieces were shipped to CERN to be lowered into the tunnel and assembled in situ, Berkeley Lab engineer Ron Scanlon, now retired, and members of the Lab's Superconducting Magnet Group headed by Gourlay of AFRD had contributed to the design of the superconducting cables for magnets in the LHC's main ring, plus supplying superconducting cable for the triplets. Most of the Lab's work on these and other aspects of the LHC had apparently been wrapped up by the spring of 2007. Then, during a high-pressure test of a triplet at the CMS interaction point, one of the three quadrupole magnets failed when its "cold mass," containing the magnet coils, broke loose. Inside the TAN vacuum chamber the LHC's two counter-rotating proton beams transition to a single beam tube, which passes through the experiment. The TAS absorbers are embedded in shielding and any adjustments must be made from outside. At CERN, the final focusing assembly was first tested at ground level (background) before being lowered into the tunnel and reassembled there. Two of the many U.S. scientists and engineers who have worked on the LHC are Fermilab’s Jim Strait, left, first head of the US LHC project, and engineer Joseph Rasson, right, who oversaw Berkeley Lab’s contribution. The test was a stand-in for the kinds of extreme conditions that might be encountered in an uncontrolled magnet quench. The problem was traced to a design oversight in the cold mass support system for the triplet magnets. During the same test, the DFBX gooseneck lead conduit to the triplet was also bent, indicating a minor design flaw in the DFBX. For the next several months teams from CERN, Fermilab, and Berkeley Lab worked to diagnose the problems, come up with solutions, and make repairs to all the triplet quadrupoles and DFBXs. Frederic Gicquel of Berkeley Lab's Engineering Division was stationed at CERN to assist in commissioning activities; he designed and installed the DFBX lead modifications. Triplet commissioning was back on track by the end of summer 2007, and on April 25, 2008, Fermilab's Jim Kerby, who now leads the US LHC accelerator project, emailed all concerned: "Last night (as everyone knows thanks to the internet) the triplet in Interaction Region 5 was powered to above nominal operating current, held, and ramped back down successfully … the triplet was again ramped to these currents and a quench induced. Analysis of the event shows no surprises … commissioning of the next seven triplets will follow very quickly …"
Three days later Pier Oddone, director of Fermilab (and former deputy director of Berkeley Lab) announced a "triplet crown." "A crown is what the folks who have worked over the last year to get the LHC triplets ready for operations at the Large Hadron Collider deserve …. This is the first time that a triplet has worked at specifications (equivalent energy of 7 TeV) as a system of three magnets with all its power and cryogenics interconnections in place." ​Although much remains to be done, said Oddone, preparations are on course for a midsummer injection of the LHC's first beams. "It is a huge enterprise and an opportunity for the world to come together in a grand adventure of discovery. The US community has made a large commitment of material and human resources to the success of the LHC."